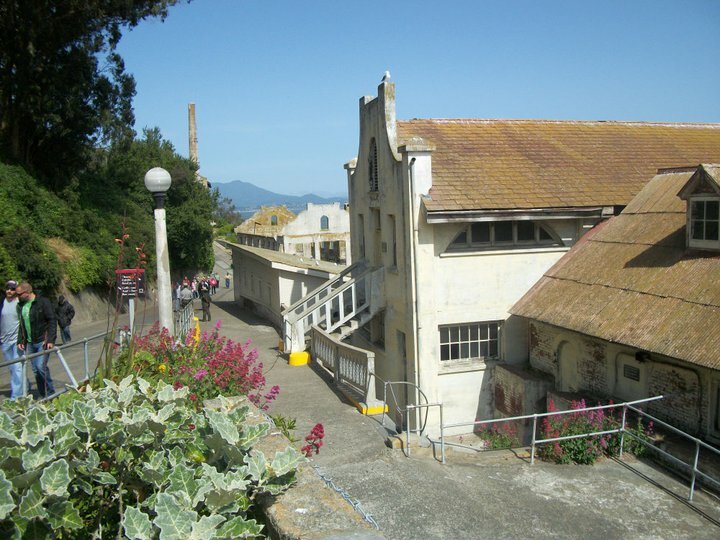 Friends of Civil War Alcatraz has been organized as a California Not-for-Profit Corporation with IRS 501(c)(3) Tax-Exempt status, EIN 27-0125508. If you would like to make a contribution but do not choose to become a member at this time, please send your email along with your check so you can receive our digital Sentinel Newsletter. Our mailing address is: Constance Smith, FOCWA, PO Box 1266, Rohnert Park, CA, 94927. Pictured left to right: Fred Bohmfalk, Brad Schall, Ranger Benny Batom and Camp #24 SUVCW Commander Charles Mabie. Alfred Pleasonton SUVCW Camp #24 and the Friends of Civil War Alcatraz presented to Alcatraz Park Ranger Benny Batom, two complete artillery uniforms to use in their interpretive programs. Camp #24 Commander Charles Mabie, Brad Schall and Fred Bohmfalk made the presentation during a special tour of the island. Donation was made in the memory of Charles Corky Reed. Ranger Batom is in charge of the school programs and Camp #24 and the Friends have offered their services to assist the National Park Service. Three years ago Brad Schall, Fred Bohmfalk and Phil Avila were asked by the National Park Service Rangers at Alcatraz if they could assist in designing a volunteer program to interpret the Civil War years on the island. The challenge was taken up with the assistance of four local SUVCW camps, all northern California Civil War Round Tables and several other interested groups. Getting started was a unique experience for the three because of the inter working of the National Park Service and rules and regulations that they new to the three. Finally a 503 C corporation was formed with 12 members. Six of the original Board members were from the SUVCW and the first tour given by the Park Service for the group had Union Soldiers dressed in Blues from five California SUVCW Camps. Our second challenge was getting trained by the National Park Service so we could be qualified volunteers. Five members have gone through 40 hours of training on the island and the Civil War experience. They are Brad Schall, Greg Tracy and Fred Bohmfalk, John Nevins and Bob Hubbs. Three years later the Friends of Civil War Alcatraz are providing a service to the Civil War community.